In the past few years there has been a growing concern for the potential health hazards imposed by use of dental materials that include toxic compounds. The most common source of concern has been the mercury found in silver fillings. Mercury is one of the most toxic metals found in nature and is a major component of silver amalgam fillings. At Dr. Dennis Nagata’s office we believe this outdated material could affect one’s overall health. Amalgam fillings are removed safely with the correct precautions and equipment used. Newer, more advanced tooth colored materials that are bio-compatible for your over-all health are used to replace mercury amalgams. Dental materials compatibility testing is available through Clifford’s Consulting and Research Lab. "Clifford Materials Reactivity Testing is intended as a screening system to differentiate potentially unsafe materials (those containing components for which the patient has existing systemic sensitivity) from more desirable materials which show no evidence of any current sensitivity issues." For more information, visit ccrlab.com. In addition to concerns of Bio-compatibility, when choosing a restoration we have to consider the size of the defect that is being repaired, the function of the tooth, and the biting surface involved. Strength, durability, and cosmetic acceptability are all considerations when choosing a restorative material. Dr. Nagata uses the CEREC one-visit method to restore the tooth with tooth colored porcelain once the mercury amalgam is removed. This method of restoration is quick and comfortable. The patient will be fitted with a permanent crown during that same visit. Composites are a tooth colored material that bonds strongly to the tooth structure and is resistant to wear. The use of these materials are restricted to smaller type fillings and areas not under heavy chewing pressure. We often encounter situations where a significant part of the biting surface of a tooth has been damaged and weakened. Here the material of choice would be a ceramic or gold inlay. Both are both well tolerated from a biological standpoint and provide the strength and durability that is needed. 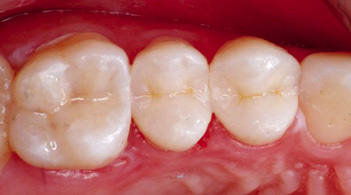 When the defect to be repaired grows to a significant size, the strength of the tooth will be compromised. 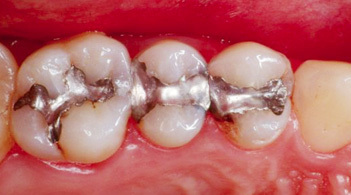 Teeth with very large silver amalgam fillings often develop cracks that extend deep into the tooth structure. These teeth are best restored by a means that covers and reinforces the strength of the tooth by completely covering it. A ceramic or gold, onlay or full crown, accomplishes this objective. Our Honolulu dental office is committed to providing patients with a lasting dental solutions that enhance overall health and well being. To learn more about bio-compatible and holistic dentistry in Honolulu, call Dennis T. Nagata, DDS today and schedule your next appointment.